Cat. No. 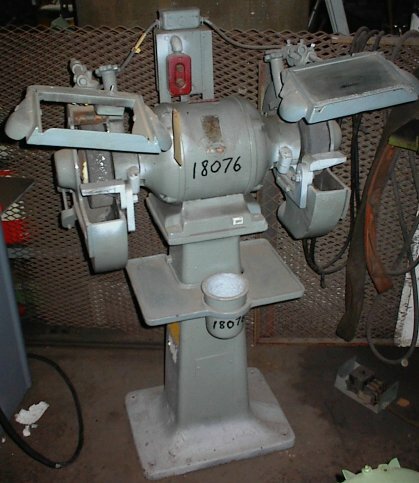 7251, S# F187, 12" x 2" Wheel capacity, Has wire buffing wheel and 10" x 2" 80 grit flex sandpaper wheel, 2hp 115/230v 1ph 3,450 rpm, Overall Dim. 42"W x 21"FB x 4' 7"H, Est. Wt. 500 lbs. Model SPL, Type 12FQ-Y, S# 236270, 12" Wheel size, Built in dust collector, 2hp 220/440v 3ph 60cyc 1,750 rpm, Overall Dim. 32"W x 3' 4"FB x 4' 5"H, Est. Wt. 1,000 lbs. Type 102-305-8, Model SPL, S# 246602, 3" x 9.5" Grind wheels, Illuminated eye shields, 5" Rear exhaust vent, Operation & technical manuals, 5hp 460v 3ph 60hz 1,200 rpm 8.5 amps, Overall Dim. 50"W x 3' 7"FB x 5' 9"H, Est. Wt. 1,600 lbs. 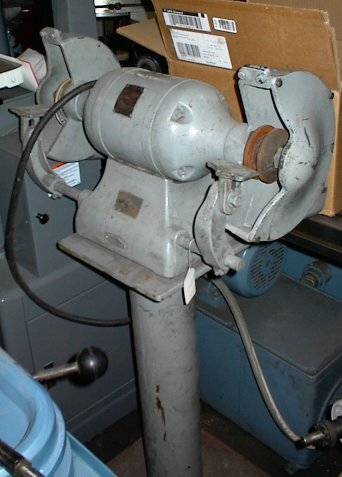 Cincinnati Pedestal Grinder 12" x 2"
Dayton Pedestal Grinder 6" x 3/4"